Sukhminderpal is using Smore newsletters to spread the word online. 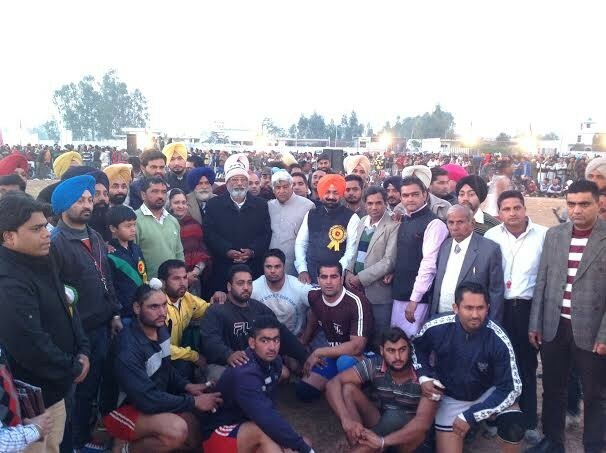 In BJYM Kwaddi tournament , National Leader BJP and Kisan Morcha's National Secretary Sukhminderpal Singh Grewal said that Narendra Modi promised to provide one crore jobs to youth. He said that AAP will affect Congress not BJP so that our party is aiming at full majority. He said that's clear to whole world and people of our country that AAP affect the Congress party not us. In a kwaddi tournament arranged by BJP youth Leader President Naujuan Sabha Sports Club, BJP Mandal President and MC Vikas Sharma @Vicky and BJYM Mandal President Goldy in the memory of Kwaddi sportsman Late. Jagmeet Singh @Jagi at Ghanaur stadium, Grewal said that our BJP's Prime Ministerial candidate Narendra Modi had promised to provide one crore jobs to the youth of the country if voted to power at the Centre. He said that Narendra Modi made a clear promise with youth that if BJP comes to power in Centre, it will provide one crore jobs which the UPA Government could not do despite announcing it before the last Lok Sabha polls. Grewal said that with 65 per cent of the Indian population below the age of 35, the youth, currently struggling with unemployment, can be galvanised into a force for the development of the country. He said that AAP can go wherever it want's so they have freedom to do it. Grewal said that it's not the first time in India, we see the History first, that a new political party has emerged and posted a good debut performance. He said that in past we have had the Asom Gana Parishad ( AGP ), the Telugu Desam Party (TDP ) etc, the AAP is also part of the same continuum of History. Grewal said that it is clear that even in the AAP's own survey report it has been said that in the Lok Sabha elections there would be a decided preference in favour of Narendra Modi. He said that yesterday, AAP have formed Government in Delhi so these day's are to congratulate them and hope that they give a stable Government to Delhi with the help of Congress Party. He said that our party BJP is preparing for elections, our aim is to get full majority. He said that BJP is very clear that tackling price rise and inflation are going to a major priority, along with providing transparent governance and provide 1 crore jobs to the youth of our country. At this time Punjab Health & Family Welfare Cabinet Minister Surjit Kumar Jyani, Raj Khurana Ex Parliamentary Secretary Punjab Government, Ex- Cabinet Minister and District President of Shiromani Akali Dal ( SAD ) Ajaib Singh Mukhmailpur, Gursev Singh Harpalpura, MLA Bibi Harpreet Kaur Mukhmailpur, District President Bharatiya Janata Party Patiala ( BJP ) Rameshwar Sharma, Ex- District President Bharatiya Janata Party Patiala ( BJP ) and Ex- Chairman Improvement Trust Nand Lal, Raj Kumar Pathi State Secretary BJP, Aseem Goyal State Cashier BJP Haryana, Vikas Sharma @ Vicky MC also Mandal President BJP and BJYM president Goldy, Kashmiri Sharma and Gautam Sood both Mandal General Secretary BJP, Ramandeep Singh ps and large number of BJYM youth and a big crowd of " Kwaddi Premi's " were present in the stadium.